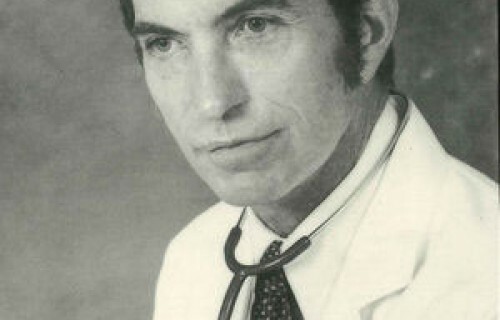 Dr. Lamb born October 13, 1926 in Fredonia, Kansas passed away on July 3, 2015 in San Antonio, Texas. He was an eminent Cardiologist and Internist and was a key scientist for the nation's man-in-space program as the Chief of Medical Sciences for the USAF School of Aerospace Medicine at Brooks Air Force Base in San Antonio. He developed the medical examinations used to select astronauts and examined everyone who has gone to the moon. Dr. Lamb received the Distinguished Civilian Service Award, the highest award the Department of Defense can give to a civilian for his contributions to the nation. James Webb, the Administrator of NASA, once wrote to Dr. Lamb, "I know of no one connected with aviation or space whom I admire more or is more universally admired than you." Dr. Lamb was a graduate (1949) and Distinguished Alumnus of the University of Kansas Medical School. After a brief teaching stint at Emory University he was awarded a research fellowship at the Centre de Cardiology in Geneva, Switzerland from the American Heart Association. He became a Professor of Medicine at Baylor College of Medicine. Dr. Lamb wrote a dozen books on health, including the textbook on electrocardiology. In addition Dr. Lamb wrote “Inside the Space Race: A Space Surgeon’s Diary” in which, according to the Amazon review, Dr. Lamb gives the reader an inside look at the events, personalities and clashes among the individuals who led and developed the program that enabled the United States to beat the Soviets and send astronauts to the moon. For 24 years he wrote a nationally syndicated column, "Ask Dr. Lamb" which attracted 400,000 letters a year from readers and appeared in more than 700 newspapers. Dr. Lamb was a Medical Consultant to the President's Council for Physical Fitness and Sports for 30 years and attended Lyndon B. Johnson when he was a Senator, Vice President and a Consultant when he became President. He endowed a prize to be awarded to graduating students from the University Of Kansas School Of Medicine who are expected to make the most significant contributions to medicine.